There are plenty of readily available rowboats and canoes that will make excellent touring or exercise rowing boats when retrofit with a FrontRower™ rowing rig. Tandem recreational canoes are plentiful and most of them make excellent rowboats. They can be rowed solo or solo with a passenger. Solo canoes are less common, and many will make good rowboats. But they will not have room for a passenger. Many "touring rowboats" or "wherries" built from kits can be used. Some recreational shells such as the popular Alden Ocean Shell will work. And some doubles kayaks with large open cockpits can be used. If you already own one of these types of boats, you may be able to use it. Email us with the make and model or a picture and the overall length and beam dimensions and we will let you know what we think. If you don't already own a suitable boat, you can probably purchase a new or used canoe in your locality. See our rowing canoes page for help with choosing one. ​The FrontRower requires open area for the pedals to swing and for the leg power ropes to travel freely. It needs an open cockpit area in the center of the boat at least 60 inches long and at least 26 inches wide at the top. There is also a "maximum beam" limitation for the FrontRower. If the boat is too wide, the oars will make contact with the gunwales, limiting their forward swing. 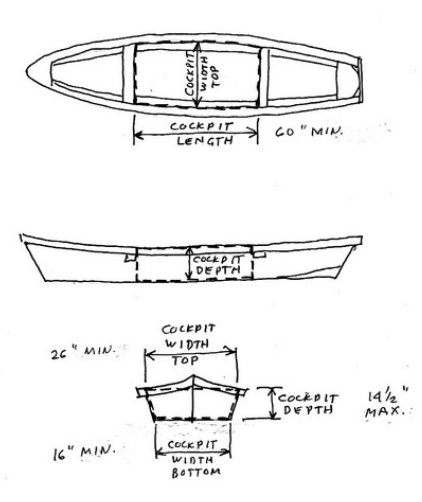 We list this at 36 inches for most canoe-like boats, but each boat is different, and some customers have done successful installations in beamier boats (up to 42 inches) with shallower cockpit depths.